Statewide permanent bicycle and pedestrian count data is now available and can be downloaded from the links below. These sites may be owned by local jurisdictions or the Washington State Department of Transportation. Please contact Joe St. Charles 360-570-2381 for any questions. Contains all the data currently being collected at the permanent counter locations throughout Washington, this is a zipped csv file. View Bicycle and Pedestrian Count Site Locations and associated data that is being collected in Washington State. The manual count data is collected by volunteers and is part of the Washington Bicycle and Pedestrian Project. 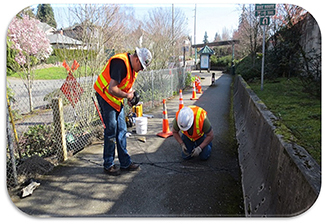 The initial installation of permanent counters is being followed by a larger effort funded by a WSDOT Pedestrian and Bicycle Program award and led by Cascade Bicycle Club with support from WSDOT. It will fund coordination with 10-12 jurisdictions to install a total of approximately 50 permanent bicycle counters statewide. The work will closely follow the methodology developed by researchers at Portland State University to establish a clear metric of bicycle miles travelled for Washington state. See more at: http://wabikes.org/2015/06/23/statewide-bike-counter-network-growing/#sthash.5ggocFma.dpuf. Data from these permanent counter locations with be added to this site as it is made available.